RTF stands for Rich Text Format, a file format provided by Microsoft. By using this we can apply more formatting features create our text data much more attractive and also add links and all that. RTF is file format that is supported by various email clients and word processors like MS word, Word Pad and etc. If you are using MS Outlook and want to read and save the content of PST files in RTF format because after converting PST to RTF, you can edit your PST file with formatting. 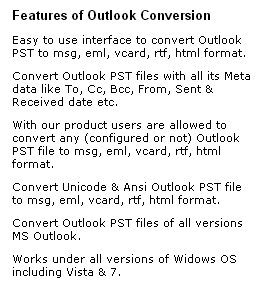 But MS Outlook does not allow you to convert Outlook PST to RTF directly. Further you need an out-sided and solitary solution to convert Outlook PST to RTF format. Don’t worry about that because now gives an advanced utility for this PST to RTF conversion. With this Outlook conversion tool you can convert Outlook PST to RTF in very few amount of time and get satisfactory result as to convert Outlook emails to RTF in its original format without any corruption. So, in one sentence we can say that our software to convert Outlook PST to RTF is unique tool of its category which will restore all email formatting and attachments during the conversion process to convert Outlook PST to RTF files. You can convert Outlook emails to RTF with retaining email properties like to, cc, bcc, sent and received dates of emails and perform PST to RTF conversion in batch mode as you can save your precious time. 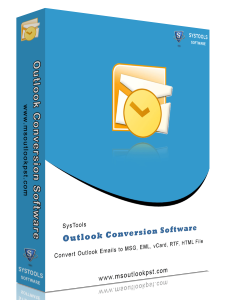 For free analysis of our software to convert Outlook PST to RTF you can download Demo version of Outlook Conversion tool. Demo version will convert only 15 Outlook PST files to RTF format but you can evaluate the working process of our software by using Demo version. Further for complete conversion you should get the FULL activation key of Outlook Conversion tool that is available only at $49. If you have any problem regarding downloading, installation or conversion process of Outlook Conversion software then you can contact our support team that is available 24x7 for your convenience.